Rich and creamy with a taste of the tropics... it was on the menu for breakfast this morning, and with its low-fat calorie count, my nearly bikini ready waistline didn't care. I must preface that we don't usually have ice cream for breakfast, but the lovely morning light streaming in my window creating an almost perfectly lit photo shoot left me with a semi-soft bowl of photographed ice cream. And, it was fabulous. Dairy free for my lactose intolerant family, those bananas stacking up in my freezer were put to good use. Trader Joe's Light Coconut Milk replace the heavy cream but didn't lose any of the luscious creaminess. A delicate swirl of melted dark chocolate hardened in the frozen concoction bringing a bite to each taste, and a topping of crunchy coconut flakes had me swooning. With visions of tropical locales spinning through my head, I just may put this delight on the menu for breakfast more often. Using up those overripe bananas never tasted so good! Brown spotted bananas might be a tad soft of eating out of hand, but make wonderful ingredients to banana recipes. 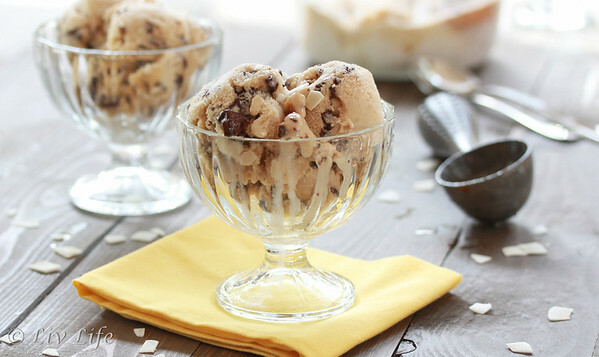 Sweeter than their less ripe cousins, the bananas bring a full banana flavor to this rich ice cream. Low Fat Coconut Milk adds that tropical flair with bringing a luscious creaminess that will have you adding this ice cream to your breakfast menu as well. Enjoy! Crack the eggs into a medium bowl and add the sugar. With a fork or whisk, whisk until the mixture is pale yellow and completely incorporated. Add the flour and salt, stir to combine and set aside. In a medium saucepan add 1 cup of the coconut milk and place on the stove over medium heat. Stirring often, bring to a simmer. Remove from the stove and slowly pour the hot milk into the egg/sugar mixture, stirring constantly. Pour the mixture back into the saucepan and place over low heat on the stove. Stirring constantly for about a minute, remove when the mixture has thickened slightly. Do NOT allow the mixture to boil or the eggs will scramble. Remove from heat and pour into a clean bowl. Add the mashed banana and stir. Then add the remaining 1 cup of coconut milk and the vanilla extract, stirring again to combine. Cover and chill for at least 3 hours, or until cold. Place the chilled custard into your ice cream maker and follow the maker directions. When the mixture is almost finished, add 1/4 cup of roasted coconut chips. Allow to finish churning. While the ice cream is finishing, melt the chopped chocolate. Set aside. 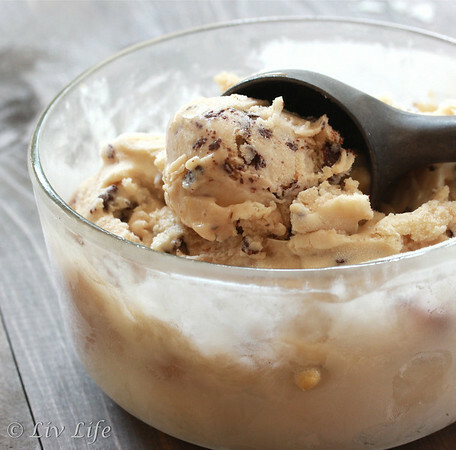 Scrape the finished ice cream into a chilled bowl and drizzle with the melted chocolate. Working quickly, swirl the melted chocolate into the ice cream. Note that the chocolate will harden quickly when it touches the cold ice cream. Cover and freeze. Serve topped with addition all roasted coconut chips. Liv Life Note: I'm positively addicted to Trader Joe's new Roasted Coconut Chips! Described as "mature coconuts soaked in fresh, young coconut milk, roasted with a touch of salt and sugar", these coconut chips are irresistible! I want a TJ!!!! But more so, I want a bowl of this! Debra... I couldn't live without my TJ! PINNED! I am on such a homemade ice cream kick, and I have a big ol' stash of frozen bananas. DONE! You rock Erin!! Thanks!! this one is a keeper. Talk about a taste of the tropics - yum!. I wonder if I could place a scoop of this on my oatmeal to replace the milk I usually use? That way I am still eating healthy and having a little treat too. I envy that you are almost bikini ready. I have been trying but it is taking longer than I had hoped. Oh, Felice... I love that idea!! 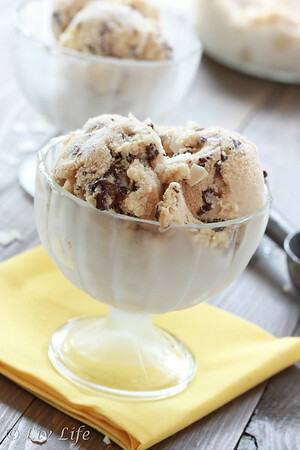 Oatmeal topped ice cream, that makes it totally healthy! I'd love to hear your version when you get it done!! Bananas just make the best ice cream. And I love that it's dairy free! Ice cream is my faaavorite but the tummy aches I get after are NOT my favorite. I'll have to try this! We have gone totally dairy free for my son... Coconut milk seems to be his favorite for flavor for ice creams and keeps him happy. I've had my ice cream maker for a few years now but still haven't made banana ice cream, which I absolutely love. And ice cream for breakfast? I've definitely been guilty of doing that more than once. This was our first try, and it turned out better than I thought! 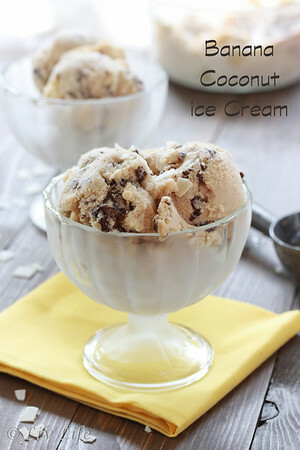 Such a good idea to use Coconut Milk (I too am lactose intolerant and thus haven't had ice cream in about 100 years). Looks delicious. And for breakfast! Reminds me of when I had a good metabolism. The good old days...before kids! You won't know it's dairy free... I love the coconut milk. Makes it just as rich as the "real" stuff! I never thought of using ripe bananas for making ice cream. What a great idea! (or it could be just me who wasn't creative enough). I'll definitely give this recipe a try when I go back to the States. I've been eating ice cream every single day in Japan... SF is too cold for that, but I'm taking advantage of ice cream weather everyday. :) Can't wait to make this. So happy I don't have to use ripe banana for baked goods. Something different and something even tastier with your recipe! Thanks for sharing! Pinned! I know what you mean Nami!! We are here in the fog, just like SF. Haven't seen the sun in days, but I've been enjoying the pics of your trip! I love icecream. I always try to make my own at home, but it never turns out as good as the ice cream shop down the street from me. I love browsing the ice cream freezer display and picking out my favorite flavor. You had me at coconut! The banana part is just a bonus. 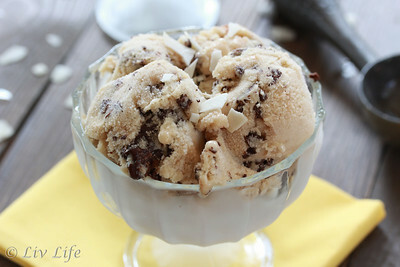 The coconut milk is such a great idea too for dairy free ice cream. I'm so glad you shared this on G+! !